Adventist Health System is the largest not-for-profit healthcare provider in the United States with more than 80,000 skilled and compassionate caregivers in 46 hospital campuses and hundreds of care sites in diverse markets throughout nine states. 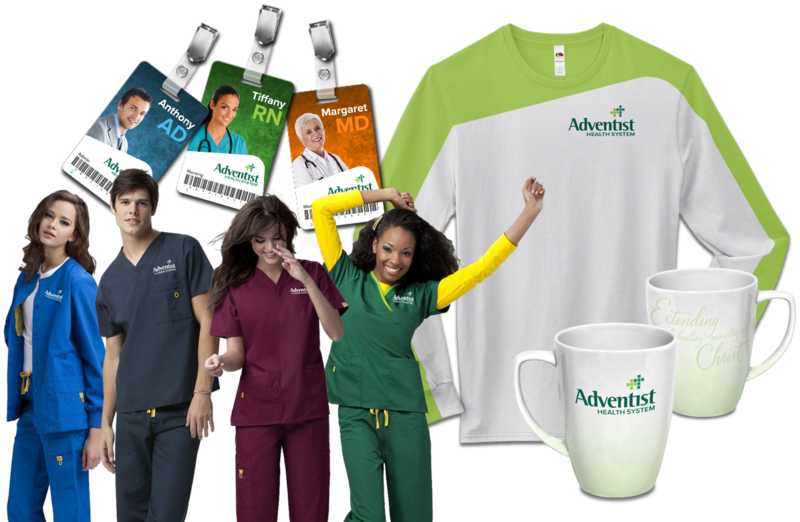 In July of 2014, we at Kennedy Global were engaged to begin exploration of a new brand for Adventist Health System. 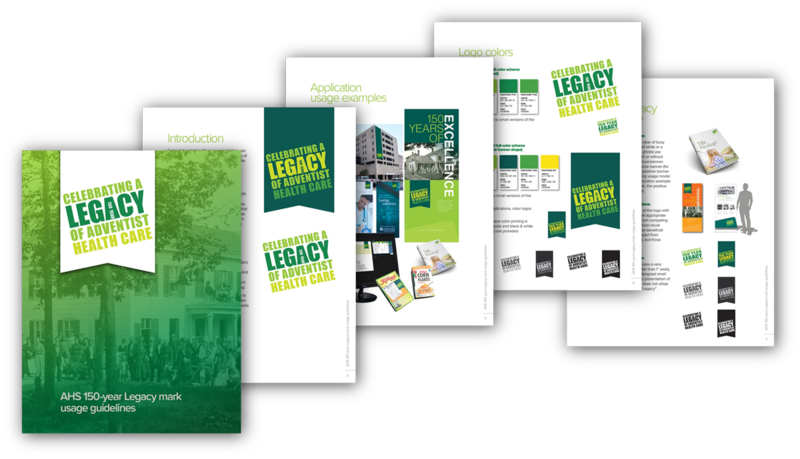 While they desired a fresh new look, one of their principle requirements was to retain iconography that would still provide strong reference their faith-based missions. Ultimately, guided by competitor studies and focus group results, we stayed with their previous “modular dual-cross grid” icon, and revised the wordmark in favor of a strongly structured letterform with a slightly softer and more approachable tone. The color palette was chosen for it’s vibrancy, intensity, and clear connection with health and growth. It’s important to note here that the “new” Adventist Health System brand shown here has been superseded by yet another update of the brand look which I was also instrumental in developing. Until the new updated brand is released to the public, I will only be able to show the interim brand development components. Vital to any brand to assure consistency and continuity, we also provided several sources for branding guideline references. A comprehensive set of guidelines presented on Adventist Health Systems’ intranet site that included specifications on every iteration of the brand mark, but also guidelines on writing styles, visual voice, signage, legal issues and much more. 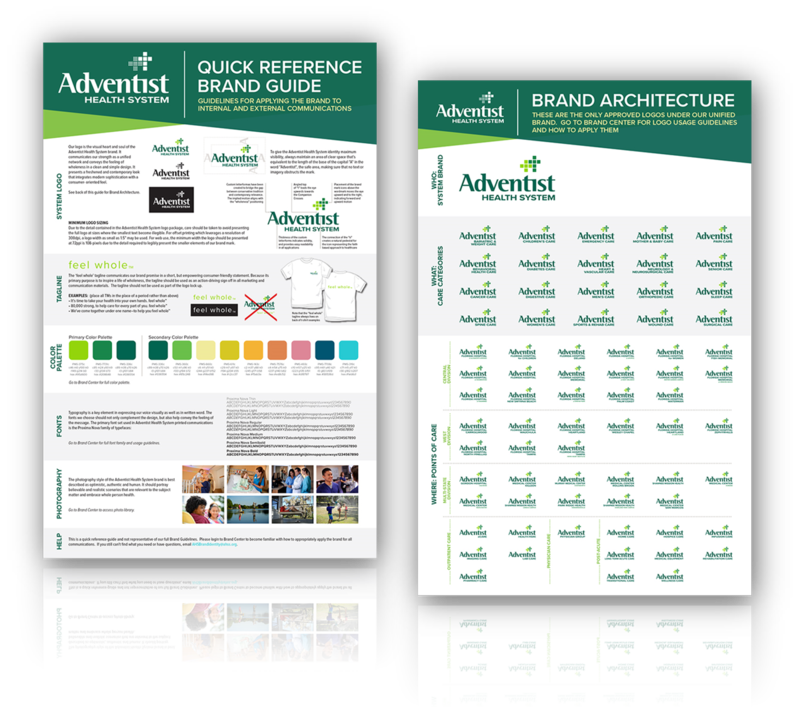 The medium-format quick reference guide shown was intended to be distributed to every one of Adventist Health System’s many media partners for instant access to some of the most basic core requirements for reproducing the brand mark. 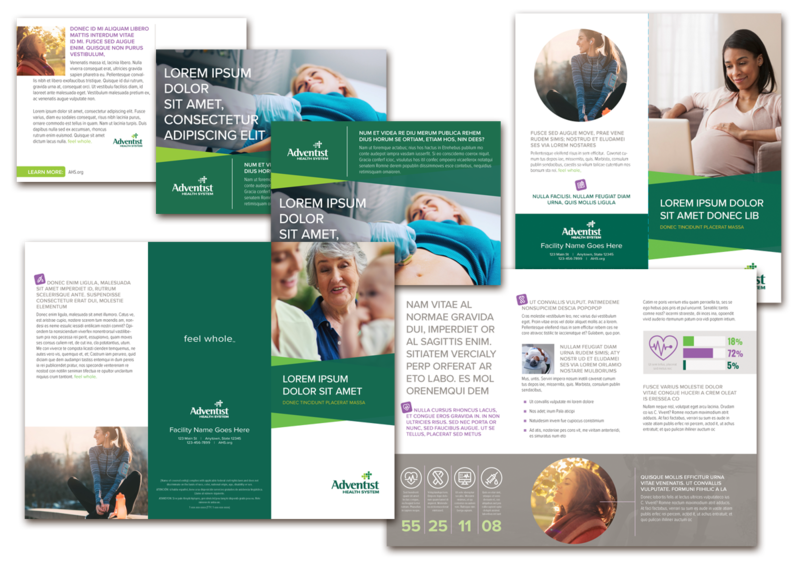 The “Angled Box” concept provided a strong reference to the individual components of the Adventist Health System identity, but it did so in a fresh, simple and dynamic way. Every scene leveraged but one primary reminder of the logomark system to reveal the message of the moment, but that single element is powerful and unique among Adventist Health System competitors. The primary purpose of Adventist Health System is to help make and keep people whole and healthy. 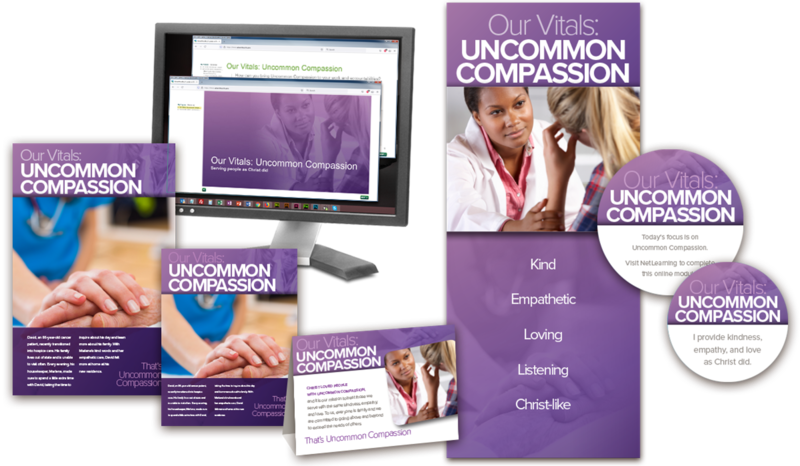 The “Lined” visual center concept keeps the human side of the health care business at the forefront of every communication vehicle presented. This concept also helps to present messages in a clean, organized fashion that never looks static or regimented, but always vibrant, organic and dynamic. Background imagery always depicts people helping others: to grow, to be whole and to stay whole. Additional studies explored the new identity in other less mainstream applications such as access badges, “scrubs” and others to demonstrate identity suitability. 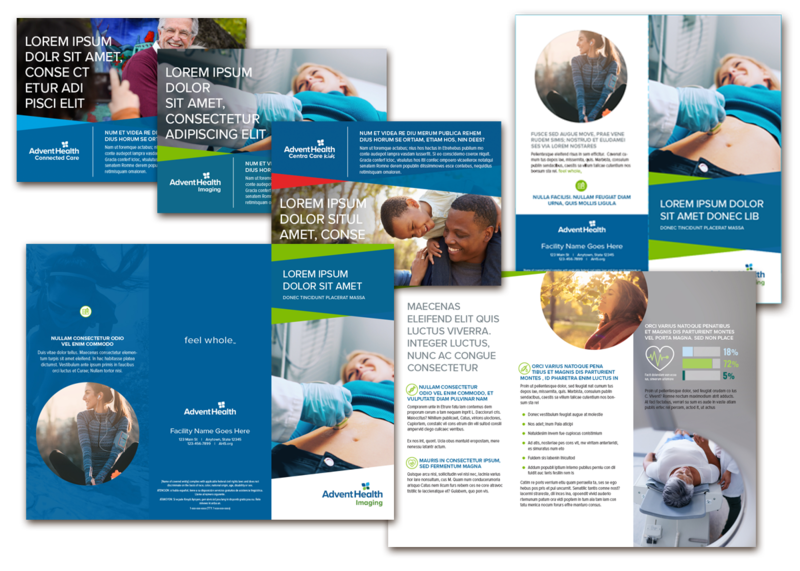 The “winning” iteration of the new Adventist Health System collateral system leveraged bold colors and simple geometric shapes to convey a modern, easy, seamless representation of the consumer experience. 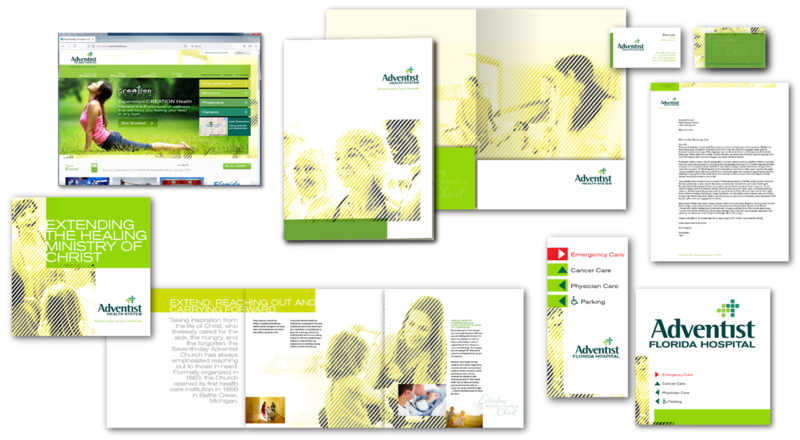 The basic template set consisted of eight different formats of their most used collateral material needs from postcards and brochures to patient guides, folio folders and large-format posters. Every InDesign template also included clear instruction call-outs on non-printing layers for easy use “in the field”. 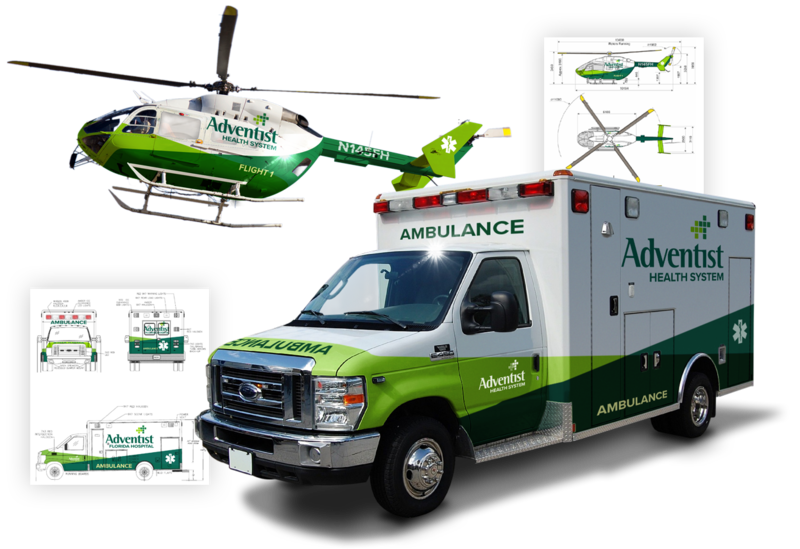 The accent elements of the accepted new brand worked particularly well to identify Adventist Health System vehicles in a public setting with the bright green coloration expressing urgency while proudly announcing the organization behind their effort. Other studies included small economy delivery cars, large panel vans and even semi-trucks. The occasion of the 150th anniversary of the Seventh Day Adventist approach to holistic health care occurred during the early phases of the new brand development, so we set aside some time to help work up an add-on identifier and a series of free-standing informational signage to help mark the event. We also produced a guide to assure the consistent use of the mark across the entire organization since numerous Adventist Health System facilities were engaged in producing materials marking the event. Concurrent with the brand development effort was a training initiative to assure that every participant in the organization would be aware of, and aligned with the basic tenets of the Adventist Health System market position and mission. We developed not only printed training aids to support the training efforts, but helped to produce the interactive online training components that would link to the Adventist Health System Learning Management System. Just as we were about to launch the new Adventist Health System brand to the world, the CEO of Adventist Health System retired and new leadership was welcomed to the organization. Understandably, the incoming administration brought some new ideas into the conversation and the decision was made to pause with the rebrand. After some additional market studies and focus groups were convened, the decision was made to re-name and re-imagine what the brand could be was made just as our retainer with Adventist Health Systems was coming to an end. It was decided that numerous agencies would re-submit multiple concepts (with rationale) for additional market and focus-group testing. The top two rows shown here were presented as alternate approaches. But in the end, the logo we had worked for several years to develop would be replaced… with a new logo which I developed! 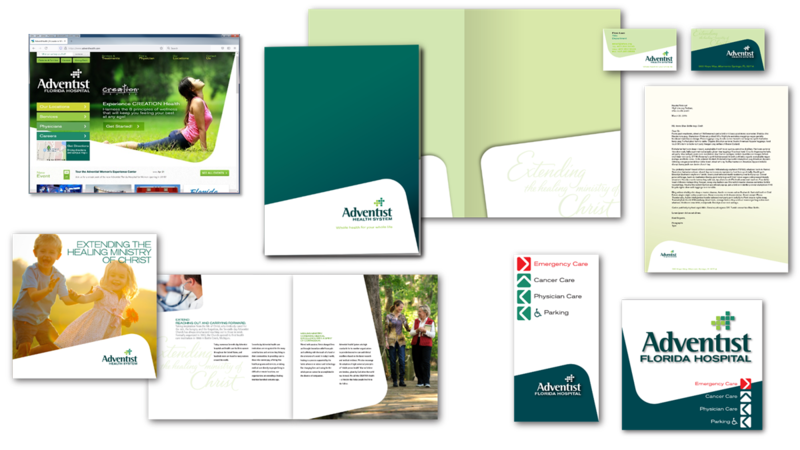 The previous generations of templates that I had been instrumental in creating were chosen to move forward with subtle color modifications to better match with the new identity, but in the end, the color and basic accent system were robust enough to transition into the new Advent Health identity.